Our own version of the green flash at sunset! 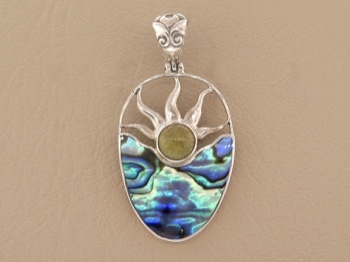 A St John opal sun with fiery sterling rays dips into an everchanging abalone sea. Set in a frame of sterling silver with an ornate sterling bail. Looks substantial but is surprisingly light weight. 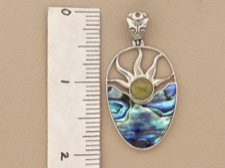 Abalone is a very common shellfish that is loved for its opalesence. 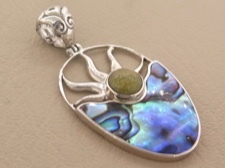 St John opal is a local rock found on remote beaches and cays around St John. An endearing and natural creation. Please see below for a size reference.